High Capacity Color Barcode technology, developed within Microsoft Research, assists in identifying commercial audiovisual works such as motion pictures and video games. By scanning the multicolor bar code with a webcam or suitable cell phone camera, consumers can obtain information such as ratings identification, promotions and pricing. Gavin Jancke, director of engineering for Microsoft Research and inventor of the High Capacity Color Barcode format. High Capacity Color Barcode technology, developed within Microsoft Research, advances the state of the art in storing digital information on analog media. 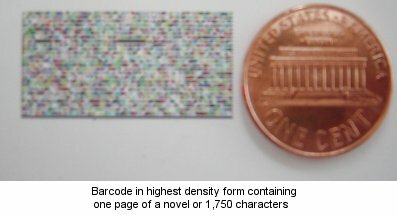 The High Capacity Color Barcode barcode format takes advantage of advanced computer imaging devices along with processing power to enable higher density storage of data on analog printed media. The format achieves this by using a different barcode symbol shape in combination with multiple colors per symbol. Currently laboratory tests have yielded using eight colors, 2,000 binary bytes, or 3,500 alphabetical characters per square inch in its highest density form using a 600dpi business card scanner. This equates to two pages of a novel. The symbol size can be changed to accommodate the differing fidelities of imaging devices. The barcode can be printed using a regular inkjet or laser jet printer. The High Capacity Color Barcode barcode has integrated digital signing features using state-of-the-art Elliptic Curve Cryptography, Public Key Infrastructure (PKI) techniques. 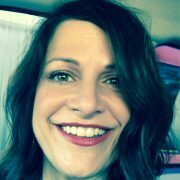 The purpose of digital signing authenticates the integrity of the data stored in the barcode, ensuring the data is unmodified from the original author. Microsoft’s advanced signing techniques employ industry known proven techniques achieving RSA-1024 strength security in only 20 bytes payload overhead. Typical existing barcode formats have the capability of storing just one item of data or requiring the reader software to have knowledge of the data stored within the barcode. 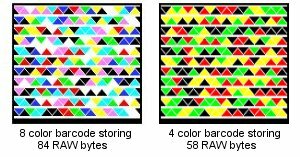 The High Capacity Color Barcode barcode can store multiple individual items of data each being compressed as optimally as possible within the physical code, implementing essentially a small file system. The High Capacity Color Barcode barcode runs on any processor or operating system platform, the lightweight mobile phone implementation can decode barcodes in realtime from a video stream, for example 30ms on a 200Mhz ARM processor. As the format uses half the symbols of its black and white counter parts, decode success rates are higher for the same black and white physical barcode size as the symbols are larger. The smallest capacity barcode can be read on cellphones without modified lenses at a print size of just 3/4″ square, outperforming QRCode and Datamatrix formats. Advanced segmentation and color processing techniques ensure good decode rates across a range of image and lighting qualities: From sharp to blurred; From light to dark. Microsoft Researchers at Intersection of Science and ArtThree members of Microsoft Research have their work displayed as part of an exhibit organized by New York’s Museum of Modern Art. Microsoft Tag, which started out as High Capacity Color Barcode technology and developed in Microsoft Research, is a new kind of bar code that connects almost anything in the real world to information, entertainment, and interactive experiences on your mobile phone. Tags are free to create and use. You can add them to your ads, posters, product packages, display it on your website, billboards, clothing—the list is endless. When you scan a Tag by using the free Tag Reader app on your mobile phone, it will automatically open a webpage, add a contact to your address book, display a message, or dial a number—there are no long URLs to type or SMS messages to send. And unlike other kinds of bar codes, Tags are fully customizable. You can create your Tags in black and white or colorful Tags that visually represent your business or personal brand in a spectacular manner.